Environmental Excellence Education, respected training academy for best practice in cleaning and environmental excellence are delighted to have been presented with two top awards at the recent BICSc award ceremony. Bernadette McDermott-Business and Curriculum Manager took Assessor of the Year whilst James Marston–Director took the International Delivery Award. Their continued robust partnership with the cleaning industry being recognised and acknowledged in this phenomenal way has left them all seriously delirious with pleasure and they would like to thank all those involved in the nomination and selection process and congratulate all the other runners up and award winners. 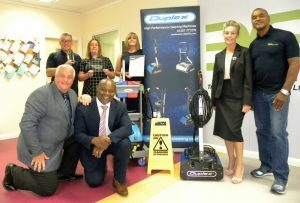 Such has been their success and following a very exciting demonstration by Duplex’s Barry Wilmot and Mike Conroy they have expanded their product range to include the Duplex 340 Steam and Jet Vac Eco in order to provide greater scope and cutting edge opportunities to their clients, students and end users. Delia Cannings, CEO commented “We strive to provide cutting edge initiatives and latest technology choices to our clients. Our training suite in Birmingham provides the perfectly controlled environment to test, evaluate, experiment, make comparisons and ultimately make informed decisions prior to investing in new equipment and cleaning resource. We are seeing an avalanche of clients from across the sector seeking new technology opportunities and at the same time reviewing efficiencies, productivity rates and best practice values. Exposure to modern technology in cleaning terms means blue sky thinking, researching the options and being a little daring. But most of all, giving clients the opportunity to try before they buy allows them to make informed choices and invest wisely.